alaTest ha recogido y analizado 13 comentarios relacionados al producto John Lewis Soyuz 3 Spotlight Ceiling Plate. En promedio, la calificación para este producto es 3.9/5, al ser comparado con la calificación 4.5/5 de otros productos en la categoria productos. Analizamos las valoraciones de los usuarios y los expertos, la edad del producto y demás factores. Comparado con otros productos el John Lewis Soyuz 3 Spotlight Ceiling Plate recibe una alaScore™ global de 82/100 = calidad muy buena. Is it OK to use 4.5W LED G10 bulbs with this item? The instructions say halogen only but 3 x 50W in a small fitting like this seems excessive. ideal and simple to fit. easy to fit and adjustable, this is a stylish product. Ordered this on click and collect and was quite surprised at how small this fitting is but the lighting it gives out is really good - very bright and exactly what I needed for my kitchen. 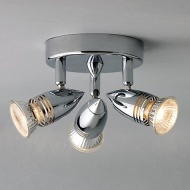 This very basic ceiling light is not only functional but looks good and priced well.